This will provide you access to PM-ABC® Free Test for 7 days. The test will have 100 questions similar to the PMP Exam format and you will need to log in to our database to start the exam. Simply click on the free simulated exam you want to use. Wait for a few seconds, as the system shown as a pop-up window being fully loaded to your computer. You will need to provide an email address to receive the exam result and the exam answer. The email will show your Matrix Chart and a Radar chart, as well as provide you a link to download the exam answer enclosed a PDF file reflecting your answer choices. How many questions were answered correctly during the test. Scores at a Knowledge Area level. This help to identify your weak areas for further study. 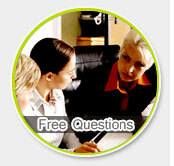 Helps identify which of your answers were wrong and provides detailed explanations for each wrong answer. Just log in again if your connection crashes, or if you need to take a break, the system will automatically save your current test answers, and will allow you to later continue taking the test from where you left off. PMI, PMP, PMI-ACP, PMI-PBA, PMI-RMP, PgMP, PMBOK and Registered Education Provider logo are registered marks of Project Management Institute, Inc.